❧ I've been very negligent of this blog. I haven't really had a whole lot to blog about lately. I'm finally the very proud owner of a MacBook (pictures soon), so I suppose that's something relatively eventful. My obsession with Kate Middleton has not gone away or died down in any way so today I bought a magazine I found in the check-out line when I was finished grocery shopping today. Every article features facts about Kate that I was already aware of but it's nice to collect things about her. I'm pretty sure I'll have a shrine dedicated to her before long. 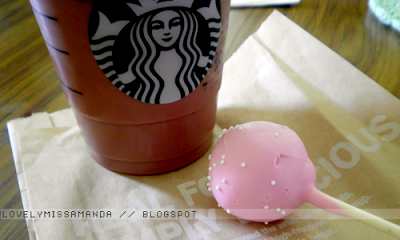 After my trip to the store, I headed on over to Starbucks. I don't go very often so it's kind of nice to treat myself every now and then. 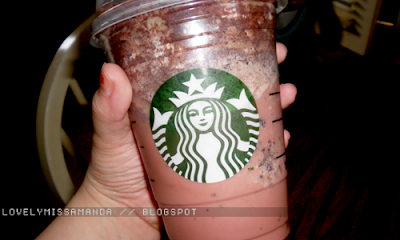 My usual go-to drink is a raspberry mocha frappuccino but today I wanted to give something else a try. I finally decided on the Double Chocolaty Chip frappuccino (I added a few pumps of raspberry, of course) and dear God... it was like Heaven in a cup. Every sip contained little chocolate chips and it was just amazing. I might have found my new favourite drink. I also picked up one of those birthday cake pops everyone has been raving about lately but I wasn't as impressed with it as I thought I would be. The presentation was nice but I guess I'm not much of a fan of cake if it's not chocolate.